*These Salmon Diver Plugs are very well priced. 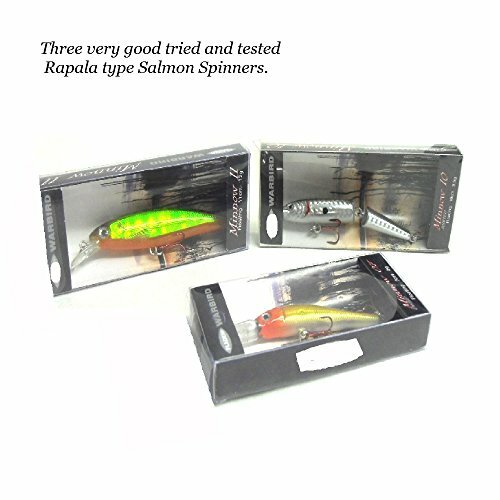 *The Selection is a must have for the Coming Season.All 3 are Different in their own Right the Jointed Diver weighs 8.5 gram (10 cm)and the Other two weigh 12 gram (11 cm) and 6 gram (7 cm) Long. This package deal contains 3 Salmon Diver Plugs.Now Reduced with Free UK Delivery.This Package Deal Contains 3 Different Salmon Diver Plugs. Fitted with Top Range Trebles and Supplied in their own Box. (FREE CD WITH EVERY ORDER)Now Reduced with FREE UK POSTAGE.